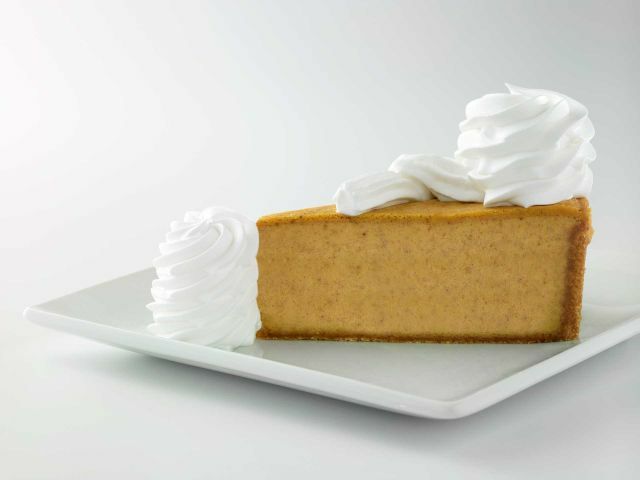 Pumpkin Cheesecake and Pumpkin Pecan Cheesecake have made their annual return to The Cheesecake Factory for 2018. The casual dining chain's Pumpkin Cheesecake features creamy pumpkin cheesecake baked in a graham cracker crust, while Pumpkin Pecan Cheesecake consists of a layer of pecan pie and a layer of pumpkin cheeescake topped with caramel and pecans and baked in a pastry crust. If you've really got a hankering for the Pumpkin Cheesecake and don't live near a Cheesecake Factory location, they sell and ship them whole on the Harry & David's website (the Pumpkin Pecan Cheesecake is not available for shipping however). If you're looking for something more affordable, Trader Joe's also offers a Pumpkin Cheesecake around this time of year (although the availability varies by store). Photo via The Cheesecake Factory.